At the tail end of last year we hosted a great seminar from Dr Stefano Moret. We had a few people who missed the talk so we asked Stefano to write us a blogpost covering the same topics and we are very grateful that he has delivered providing us with this piece about his work on long-term energy planning under uncertainty. You can also download a PDF of his slides from the talk. Every day, we consume energy to satisfy our needs: we consume energy to move, to heat and cool our houses, to power our laptops and to cook our food, among others. Today, this energy is mostly provided by combustion of fossil fuels, which in 2016 still accounted for 81.1% of the world primary energy supply. Combustion of such fuels is the primary source of anthropogenic greenhouse gas emissions, and thus of climate change. The dramatic evidence of climate change is making the transition to more renewable and sustainable energy systems an urgent global priority. This means that, as you are reading this blog post, various countries and communities are defining long-term energy plans to decide which resources and technologies will supply their future energy needs. Decision-making under uncertainty is also part of our everyday life. Consider buying a new car: should you already get an electric one? In case you buy an electric car, how will the electricity be produced? How will the prices of gasoline, diesel and electricity evolve in the next years? If there is so much uncertainty associated to such a “simple” choice – purchasing a car – imagine the uncertainties associated with defining the energy strategy of a country! Energy planners normally look 20-50 years ahead, and often make use of energy models to support their decisions. Quite surprisingly, in the current energy planning practice, most of these energy models are “deterministic”. This means that they do not consider uncertainty and rely on long-term forecasts for important parameters such as fuel prices and demand. But, how accurate are these forecasts? Various retrospective studies – i.e. studies going back in time to assess the quality of forecasts made in the past – show that long-term energy forecasting models are inevitably inaccurate as they fail to account for pivotal events in history. The analysis shown in the figure below is no exception to this. In the figure, we compare the annual forecasts of natural gas (NG) prices published by the U.S. Energy Information Administration (black lines), with the actual prices (red line) for the years 1985-2015. Errors are surprisingly large: they range from a maximum overestimation by a factor of 3.32 in 1995, to a maximum underestimation by a factor of 2.95 in 2005. Natural gas for electricity production price in the US: comparison between the yearly EIA Annual Energy Outlook (AEO) price forecasts and the actual values for the years 1985-2015. The black lines are the forecasts made in different years. The red line indicates the actual price. The blue line is the most recent forecast (2015). The consequences of such errors can be dramatic. For example, incorrect projections of low natural gas prices and high electricity demand in Europe in the early 2000s stimulated massive investments in electricity generation, which led to the current condition of overcapacity in the European electricity market. The situation is even more dramatic in the Netherlands, where various newly constructed (and never used!) NG combined cycle power plants were shut down in 2014 because they are not economically viable to operate. The unreliability of long-term forecasts shows the importance of considering uncertainty in energy planning; however, uncertainty is still very seldom accounted for in energy models, and applications are often limited to considering only a handful of uncertain input data. In most cases, these rarely go beyond simple sensitivity analyses. How does uncertainty impact strategic energy planning and how can we facilitate the integration of uncertainty in energy modelling? Energyscope is a novel open-source energy modelling framework. Compared to other existing models – which are often proprietary, computationally expensive and only focusing on electricity supply – the energyscope model looks at the entire energy system, identifying optimal investment and operating strategies in a faster and more intuitive way. The input-output conceptual structure of the model is shown in the figure below. So far, the model has found application in Switzerland (at national, regional and urban level), internationally (Belgium, Chile, Cuba, EU), and is at the heart of energyscope.ch, an online platform helping citizens and politicians understand and decide about the Swiss energy transition. A new method for decision-making under uncertainty: we propose a complete framework (based on robust optimisation) allowing the consideration of hundreds of uncertain inputs in energy models in a computationally efficient way. Overall, these methods provide stepwise guidance for energy planners from the development of the energy model to the definition of the energy strategy considering input uncertainties. To answer the research question above, we systematically applied these methods to the national energy system of Switzerland. Our main finding is that uncertainty dramatically impacts strategic energy planning decisions. In fact, the deterministic solution – in other words, the energy strategy defined without accounting for uncertainty – drastically changes as soon as uncertainty is considered. Forecasts are inevitably inaccurate, and thus it is crucial to consider key uncertainties in energy models to encourage investment decisions that are resilient and robust. Robust optimization results: evolution of the energy system configuration under uncertainty. 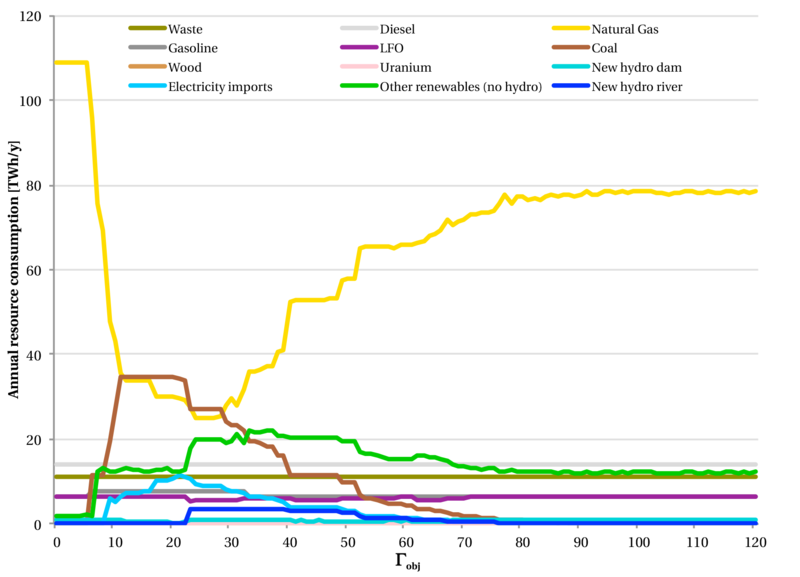 An increased protection against uncertainty (from left to right) is associated to a higher penetration of renewables and efficient technologies in the energy system (LFO: Light Fuel Oil) Click to enlarge. Our robust optimization framework enables systematic integration of uncertainty in optimization-based energy planning models for decision support. As shown in the figure above, robust energy strategies are characterized by a higher penetration of renewables and efficient technologies. Simulating the resulting systems reveals that robust investment strategies offer more reliability (e.g. low risk of not meeting demand) and stability over time, due to a reduced dependency on highly volatile pricing of fossil fuels, with marginally higher cost. Overall, our results suggest that a robust energy strategy with a higher penetration of renewables might not be significantly costlier than a business-as-usual, fossil-based, alternative. Long-term energy planning (over 20-50 years) is mostly based on forecasts (e.g. of fuel prices, energy demand, etc.). As these forecasts often prove to be inaccurate, it is crucial to consider uncertainty in energy planning models to ensure making resilient and robust investment decisions. However, this is seldom done in the practice. The energyscope model is a new open-source energy modelling framework which allows consideration of uncertainty in energy models and thus the definition of more robust energy strategies. These robust strategies are characterized by a higher penetration of renewables and efficient technologies, and are not significantly costlier than fossil-based alternatives. Dr Moret is currently a postdoctoral researcher and lecturer at École polytechnique fédérale de Lausanne (EPFL), where he is part of the Industrial Process and Energy Systems Engineering (IPESE) research group. he holds a PhD in Energy from EPFL and his main research interest is modeling and optimization of energy systems, with a particular focus on the consideration of uncertainty in energy planning. He is also the main developer of the open-source energy model “energyscope”. Next Is a 100% renewables electricity system compatible with the UK’s Paris Agreement commitments?